This Christmas, sport a stunning nail art inspired by awesome holidays and festive spirit ideas! Christmas is here! It’s that time of the year when we sing, eat and make merry. Right from decorating our house with Christmas-y ornaments to giving ourselves a nice, cozy makeover, this is indeed a time to re-visit some of the best picks of the year coming to an end. Whether it is a Christmas party at home or attending dinner/lunch at a friend’s place, you must not ignore your hands. Keep them nicely moisturized and sport a stunning nail art design which is inspired by the holiday season. It can look cute, dramatic or elegant. It can match your outfit or the mood! Whatever maybe your style, just keep the festive cheer and spirit alive in you by taking your pick from our 21 awesome nail art ideas. Who said French tips should be subtle and simple? This Christmas, give them a quirky twist. Wear hollies, Christmas ornaments, candy canes and fancy disco balls in style on your nail tips. 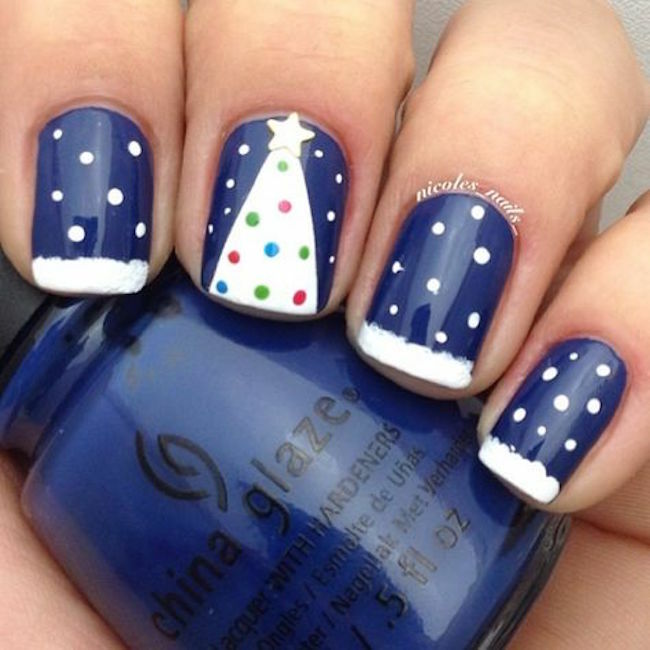 Did you just take a peek at this very creative and classy Christmas nail art (above)? French tips can’t look classier than this. Simple yet very eye catching design. Isn’t it? Who doesn’t like the impact of glitter on a dull, winter morning? 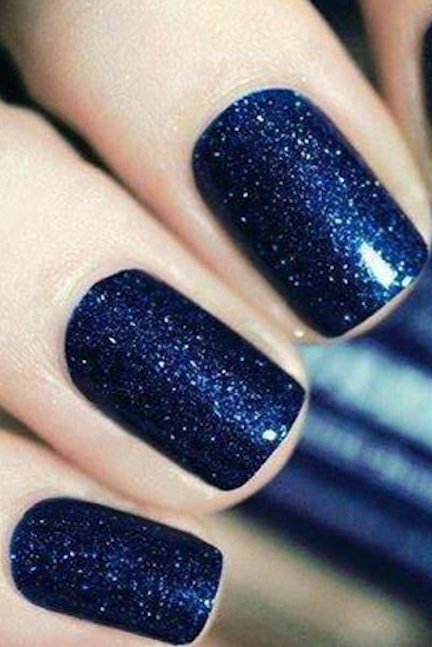 For Christmas, there is a special reason why you must add shimmer to your nails! Whether it is snowman inspired Christmas nail art or the decorated X’mas tree, use your own creativity to recreate the snow and tree-top decoration by making use of a beautiful combination of nail polish and glitter polish for that sparkling effect. 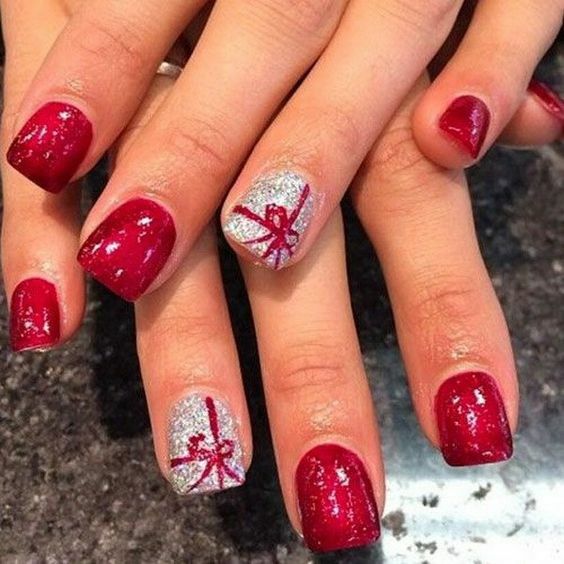 You can also add a hint of glitter to the ribbons and bells drawn neatly on your nails. The best representation of Christmas that can be worn on your fingernails is that of a Christmas tree. 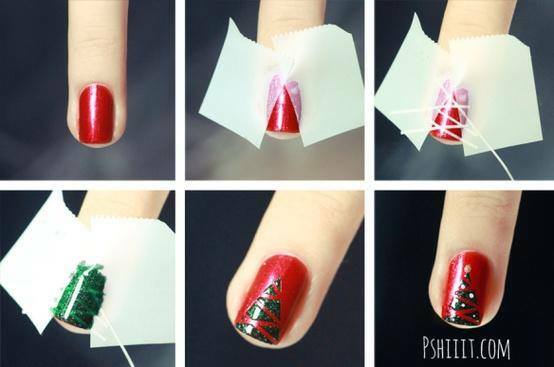 You can recreate a cute Christmas tree nail art as well as add other winter motifs to the fingernail-canvas. For a neat, super professional look, you might want to use thin strips of scotch tape. And why just stick to a good old Christmas tree? You can also make symmetrical outlines of hollies, candy canes and other motifs using scotch tape. Polkas too can look super Christmas-sy! How? Well! Design your nails in green polish topped with white polka dot polishes and candy cane details for a cute, quirky look. You can also recreate snow via polka dots. Here is a great inspirational design for you. A gold and white themed Christmas nail art which gives an impression of snow fall on a sparkling winter night! So, this Christmas, choose from our handpicked classy and elegant looking festive nail art designs your nails. Wishing you Merry Christmas way well in advance! ← How to apply gold glitter, cut crease smokey eyes for NY bash!